Thanks to the Pre-cocking and Smart Trigger functions, you can achieve a trigger response similar to a real gun. The Programmable Burst (1-5 rounds) enables you to fire a pre-determined number of BBs, which is very useful in MILSLIM and for using low-caps. Another function is ROF Control, which allows you to reduce ROF, so you can use strong LiPo batteries, and still have ROF just like in a real rifle. If your AEG becomes jammed, the Smart Fuse protects the battery and the motor against damage. It also prevents deep battery drain. Moreover, with WARFET you get: Mosfet, ON/OFF Active Brake, Built-in self-test, Debouncing, and more. Many useful functions, great electrical specifications and conformal coating (military specifications: MIL-V-173C) make the AEG Control System able to meet the needs of most experienced airsoft players. 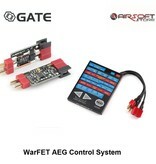 The outstanding Tactical Programming Card provides you with very easy access to the WARFET Power Module settings. All you need to do is to connect the Tactical Programming Card between the battery and the Power Module. A big advantage is that there is no need to use any additional wires. The WARFET Power Module can be fitted out of view in your AEG, and you still have easy access to its settings. The Tactical Programming Card communicates with the WARFET Power Module and displays the most recently saved settings. You can simply change them using three buttons. Burst mode enables you to make 3-shot series. In this way you can save ammunition and increase the realism. You can change AUTO mode to BURST mode or SEMI* mode to BURST mode. If in SAFE/SEMI/BURST mode you release the trigger earlier, you can make one or two shots. The burst time is set in the menu with accuracy to 4ms. The processor actively compensates for the change in burst time with a decrease in the rate of fire due to battery discharging. This ensures there is no loss of the rifle’s rate of fire, so you can use stronger LiPo batteries, and still have ROF just like in a real gun. Protection against Over-Discharge of the Battery. Modern LiPo and LiFe batteries are very sensitive to over-discharge. If you do not want to damage the battery and you care about its service life, this protection is indispensable. The microprocessor monitors the battery voltage constantly. When the voltage drops down to a critical level, the Controller will not allow firing. We have developed an electronic fuse with an accurate current sensor. A combination of current, voltage and temperature measurements makes your AEG installation highly reliable. It protects the MOSFET against overheating, overloading and short-circuiting. If your airsoft gun becomes jammed, the function protects the motor and battery against damage. We know how important reliability is on the battlefield. That’s why the unit has thermal protection. In tandem with a time-lag fuse, it fully protects your AEG installation. Thanks to the Mini Tamiya Adapters included in kit, you will be able to smoothly connect AEG Control System to your original installation. It makes easier starting your adventure with a new product. The quickstart contains basic information and hints.